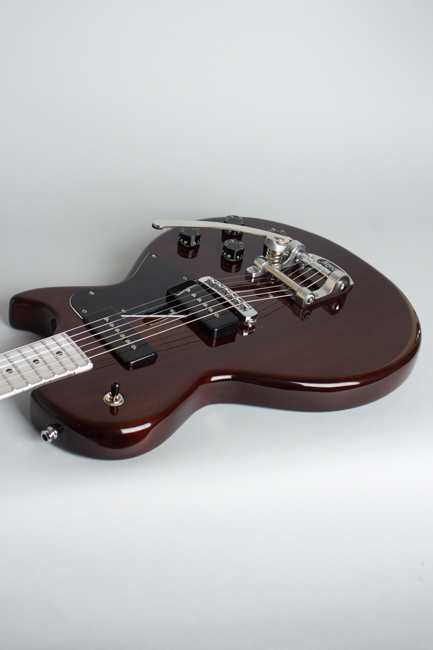 Electrical Guitar Company (EGC) Custom Model Solid Body Electric Guitar (2015), made in Pensacola, Florida, serial # 1133, dark mahogany lacquer finish, mahogany body, aluminum neck and centerpiece, gig bag case. This guitar is a one-of-a-kind creation from the Electrical Guitar Company (EGC) of Pensacola, Florida, current makers of Travis Bean instruments as well as their own designs. 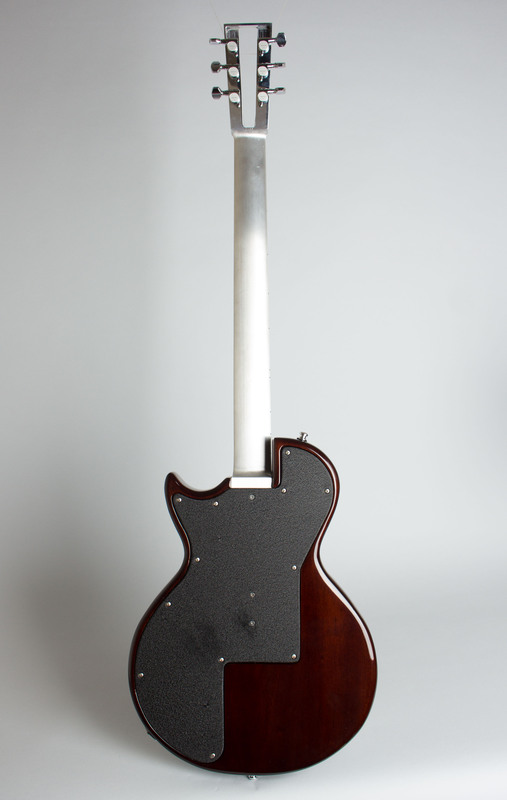 This instrument is not a stock model, but a unique custom order built in 2015 by Kevin Burkett. The serial number is 1133. 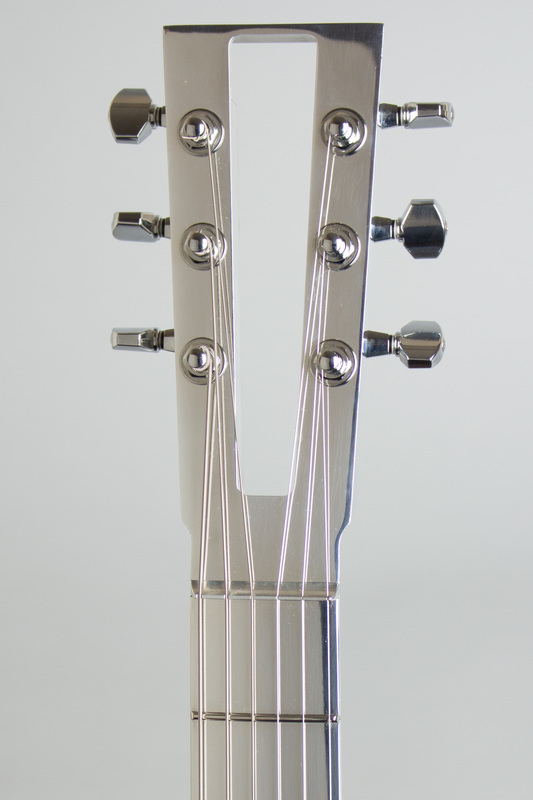 It is built with a very thin aluminum neck with 22 frets, a 25.1" scale, and a 12" radius to the polished, natural aluminum fretboard. 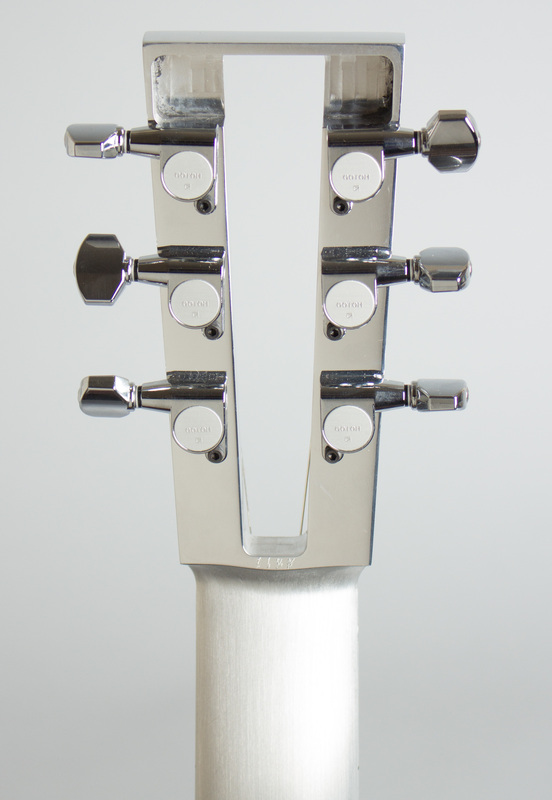 The headstock is a modified Travis Bean style with an open center fitted with Gotoh Rotomatic style tuners. 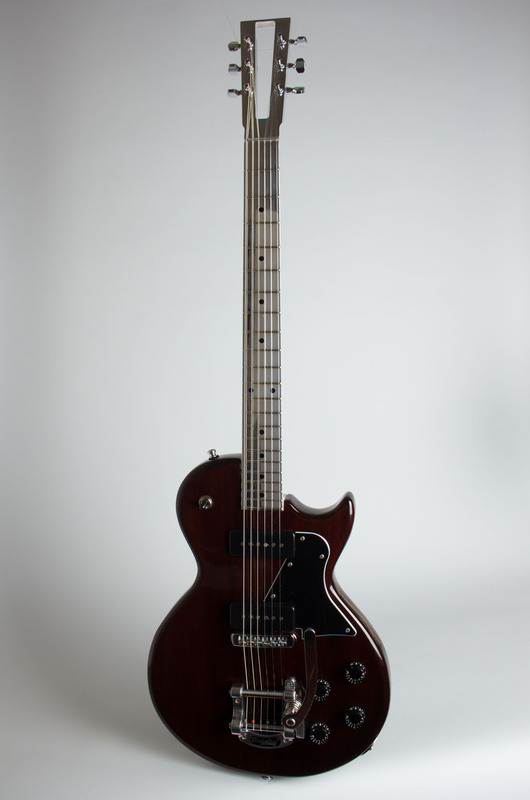 The body is solid mahogany and modeled after a '50s Les Paul Special, fitted with two EGC P-90-style pickups with non-adjustable poles. The controls are standard to the Les Paul model with a single selector switch on the upper bout and two volume and two tone controls, outfitted with Gibson 1950s-style speed knobs. 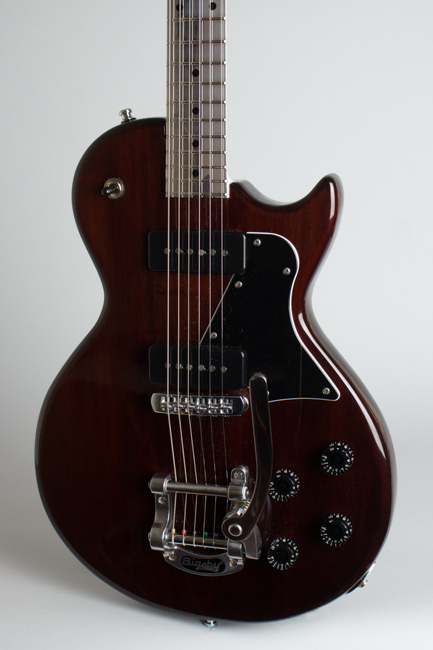 The instrument is also fitted with a horseshoe-style Bigsby-licensed vibrato and Schaller roller bridge. The EGC company is a limited production operation with a strong cult following, and currently has a notoriously long wait-time even for production models. 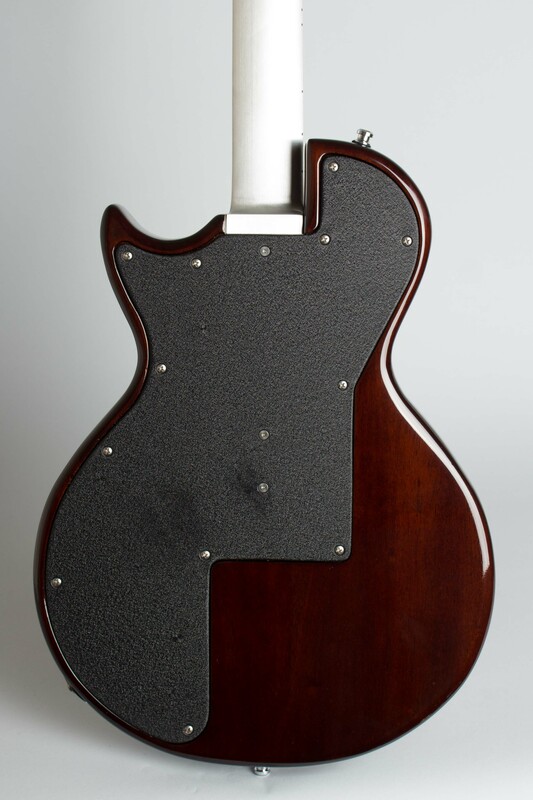 This unique custom instrument is in near-mint, unmodified condition and is a fabulous and unique example of their finest work. Overall length is 41 in. (104.1 cm. ), 13 3/8 in. (34 cm.) wide at lower bout, and 1 5/8 in. (4.1 cm.) in depth, measured at side of rim. Scale length is 25 in. (635 mm.). Width of nut is 1 11/16 in. (43 mm.). This guitar shows only very light signs of play, with some slight scuffing to the pickguard, and the neck shows fingerprints immediately! A super clean and unique example of this sought-after modern maker's wares. Near Mint Condition.